Reviews of some of today's hottest authors and their books! Meghan Edwards goes to the town of Ashton to solve the mystery of her sister's death. Fiver years earlier her sister died of an apparent suicide. The report was that she died of an overdose of drugs. Five years later Meghan finds a letter from her sister to her that she had never received. This letter leads her to believe that her sister was murdered. Meghan goes to Ashton in search of answers, but finds out that it is a lot harder than she expected. Nobody in the town of Ashton wants to talk to her. She meets the black sheep of the town Nick Hawkinson. Almost the whole town is against him and he is blamed for her sister death. This makes Meghan want to know more about him. She finds out that there is much more to him that the town knows. He may not be all-bad after all. Meghan went to Ashton in search for answers to her sister's death, but instead she finds love. She is determined to prove that Nick is innocent and find the real killer. This book held my interest through the entire book. Through the whole book I had guessed who the killer was and in the end I was right, but it did leave you second-guessing yourself a couple of times. Ashton's Secret was very well written and the story flowed perfectly. I never found a part in the book that bored me. When I started reading this book, I planned on only reading a couple of pages. I started reading it at work and before the day was out, I hadn't done any work. I read the book straight through. 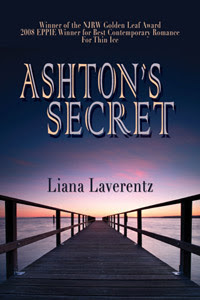 Ashton's Secret will pull you into the town of Ashton making you understand and love the characters. The whirlwind romance of Meghan and Nick kept me wanting to read. This is a book that you won't regret reading. Thanks so much! I appreciate all five smacks! It comes out tomorrow, so this was a complete surprise! What a wonderful review, Liana, congratulations! I've just started reading this book and am loving it. I actually started reading it a while ago, but 'life' got in the way among other things and it's too good a book to be rushed, so now I'm going to just relax and enjoy it! Welcome to Mistress Bella's Reviews! We love to showcase authors, their work and anything else they care to share. Please visit us often for the latest spicy reviews! Want to Become a Reviewer With Us?